PINEHURST, N.C. – It may seem silly for a golf addict from Chicago to visit the famous Pinehurst Resort – if only for a few days around Christmas – and not hit a shot. That’s what I did at the start of a long winter trip that will include plenty of golf, I guarantee that. 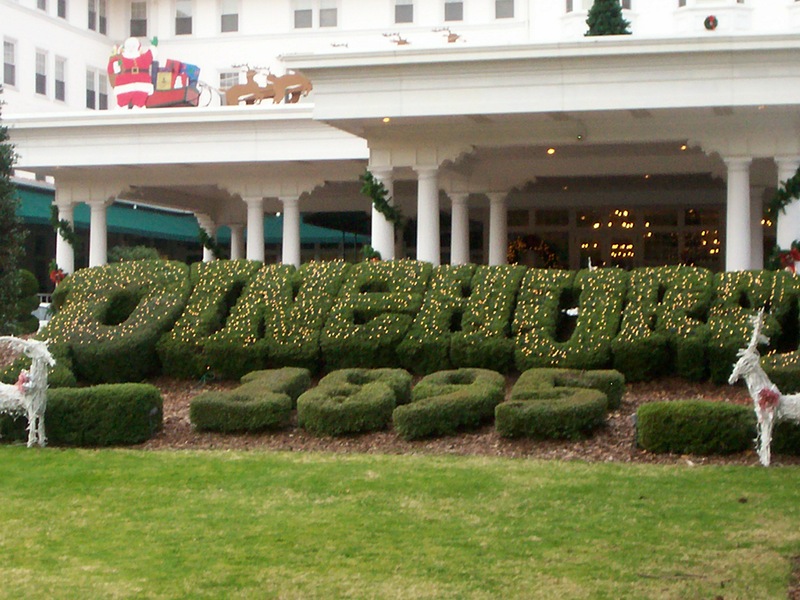 A Pinehurst stop, though, was appropriate because in 2014 that resort, its entrance pictured above in the heart of the Christmas season, will take on something no golf facility has ever done. It’ll host – on successive weeks in June – the men’s U.S. Open and the U.S. Women’s Open on the same 18-hole layout. The buildup to the big golf doubleheader should be followed closely in coming months. In my book, it’s a far more cutting edge, risky endeavor than the U.S. Golf Association’s more recent, highly publicized decision to eventually ban anchored putters. Playing the two national Opens back-to-back on the same course should give a particularly big boost to the women’s game, but will also impact the elite players, the amateurs who will be watching on TV and the resort itself, which has never been reluctant to take on big projects. The USGA made the tournament schedule announcement amidst limited fanfare in 2009. The following year architects Bill Coore and Ben Crenshaw were hired to supervise a restoration project on Pinehurst’s No. 2 course. They completed the project in March, 2011, with the return of wire-grass in the rough areas the most striking feature. It had been part of the original course, designed by Donald Ross in 1907. Ross was head professional at Pinehurst and lived off the third hole on the No. 2 course, which has come to be called “The Deuce.’’ His architectural efforts world-wide are legendary and the wire-grass will become a household name for golfers once they see how it impacts the two Opens. I’ve played it, and I like it, but – like the USGA’s decision to schedule the major championships back-to-back on the same course – opinions in the golf world are not unanimous on either. The Christmas visit was my fourth to Pinehurst since 1999. I was there for two successful U.S. Opens and again when wire-grass was re-introduced in the spring of 2011. Given the long preparatory saga that Medinah went through leading into this year’s Ryder Cup, I suspected I’d see some evidence of preparatory work at Pinehurst. I didn’t see much, the most notable being Lee Pace’s latest book — “The Golden Age of Pinehurst,’’ which was on sale in the Newstand at the resort’s hotel. Pace, a freelance writer who lives an hour away in Chapel Hill, previously authored two versions of “Pinehurst Stories’’ (1991 and 1999) and “The Spirit of Pinehurst’’ (2004). Pace’s latest book updated the 2004 version, including in it the details of the architectural work done by Coore and Crenshaw. I had a talk with Pace after ending my latest visit, and he pointed out that the restoration project and the unusual scheduling of the two big tournaments weren’t related. The men’s U.S. Open is returning to Pinehurst in large part because of the success of the previous tournaments there, and the U.S. Women’s Open had three successful stagings at nearby Pine Needles since 1996. There was some doubt that Pinehurst could handle a U.S. Open prior to 1999. They were unfounded. Hotel space was limited in 1999 but improved in 2005 and four more hotels have since been built in the neighboring towns of Aberdeen and Southern Pines. Population of Moore County has also increased, from about 50,000 seven years ago to nearly 90,000 now. Reg Jones, who had worked for Pinehurst while directing the two previous U.S. Opens there, now has an administrative office at Pinehurst in preparation for 2014. Otherwise, there aren’t many outward signs of the big things coming. As for our stay, everything was very much fine – even though the atmosphere was much different than it will be in June, 2014. Christmas at Pinehurst didn’t have the hustle-and-bustle of other places, visitors weren’t as numerous as they are in the golf season and some of the quaint little shops in the village operated on limited hours. Instead Pinehurst offered its trademark great breakfast buffets in the Carolina Room and more casual dining in its Ryder Cup restaurant. The courses were open, with the exception of No. 8. It was closed to facilitate work projects. Rather than play golf, a hike in the nearby arboretum area was a worthy substitute. All in all, not a bad way to celebrate Christmas. I certainly can recommend it.